To review the purpose of the Journal and submission guidelines, click on LCG Journal. The following is a summary description of my pilgrimage to the Holy Land, followed by daily posts containing details and pictures. The pilgrimage participants (48 total) gathered as a group at JFK Airport March 6, for departure at 12:00PM. The pilgrimage began during the first week of Lent while Israel is in the winter season. The weather was clear with only two days of light rain at the end, otherwise, it was quite pleasant daytime temperature between 60 and 70°F (A good time to be there, given that some summer days reach as much is 150° at certain sites). 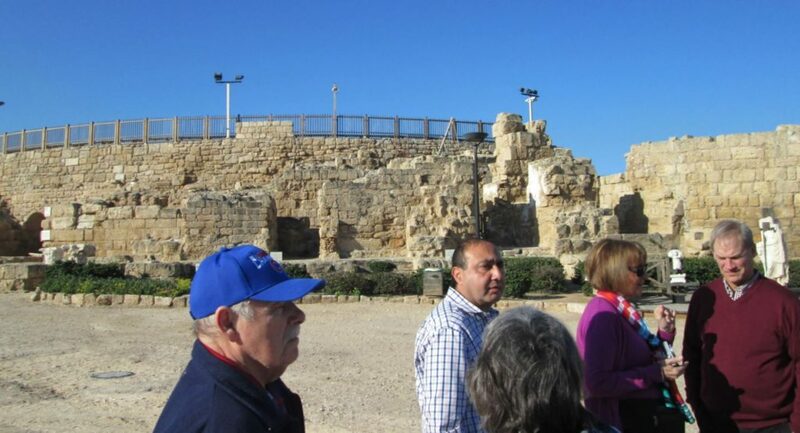 This was a guided pilgrimage tour with 48 people visiting about 32 holy sites in Israel. Once at a site, our guide gave a comprehensive explanation of what we were about to see followed by a walking tour complete with time for photographs. 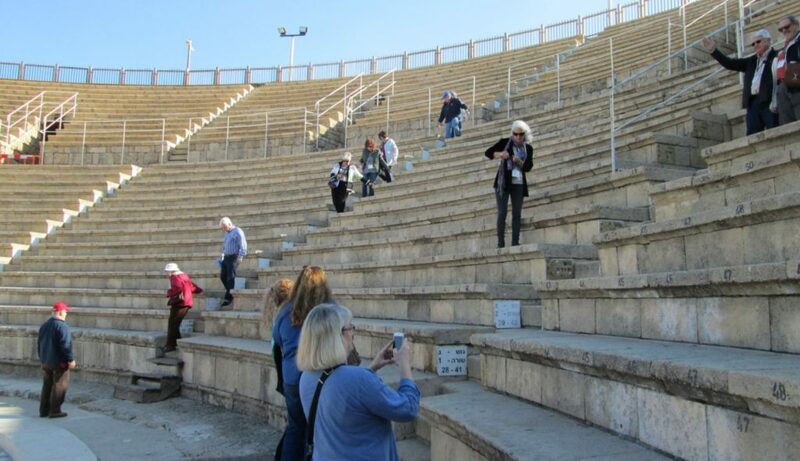 While I had done some preparation and reading about the sites we were about to visit, my focus was on tthe spiritual significance of visiting the places where Jesus lived and died. Lent is a natural time for Christians of all denominations to come to the Holy Land as both pilgrims and tourists. For the locals, it is a brisk business. My fellow pilgrims found ourselves, at times, among large crowds of people squeezing by each other, bumping into each other and navigating with varying degrees of Christian courtesy. It seems that groups of people/pilgrims have a need to talk and communicate their experience even in holy places of silence and prayer. Initially, I was not distracted by this, but it did wear my patience toward the end making it harder to “Love thy neighbor” as thyself. I also found that as the tour progressed the amount of information to be absorbed quickly became a significant overload. After a while, keeping it all straight and organized in my mind and remembering the details became a real challenge while jockeying for position for a good photo. It soon dawned upon me that my pilgrimage, after traveling almost 6000 miles was not so much about this place I had come to, or the various aids provided by archeological understanding, but was about how well I relate to my neighbor–wherever I am. It is less about time and place and more about relationships. The typical day consisted of visits to about five holy sites. The day began with breakfast at 6:00 AM and usually ended around 5:00 PM in the afternoon followed by a welcome dinner. We typically walked 3 to 5 miles each day most of which consisted of many steps up and down throughout the sites. 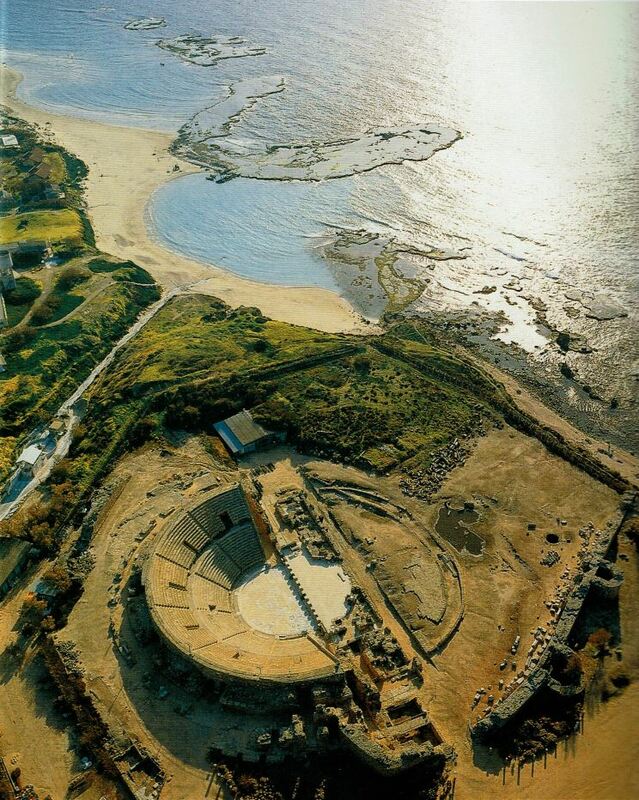 Drive north today to Caesarea to view the ruins of the Crusader’s fortress and moat and sit in the great Roman theater. 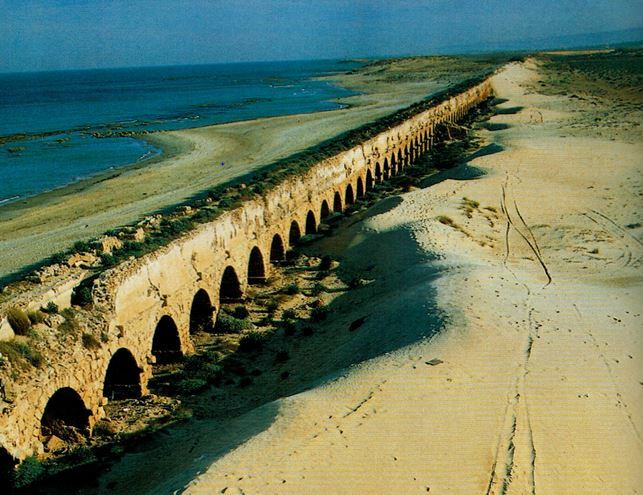 Continuing along the coast, you will see the aqueduct that carried water from Mt. Carmel to Caesarea. On to Megiddo located on the Plain of Esdraelon. 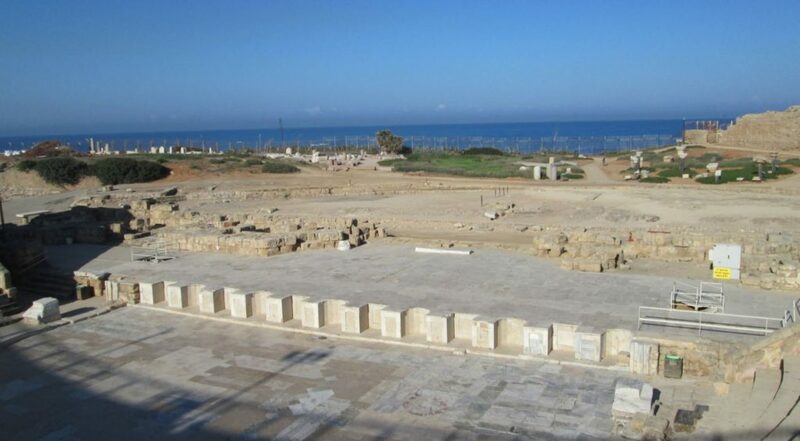 Visit the museum, ruins of the city and Solomon’s Stables. 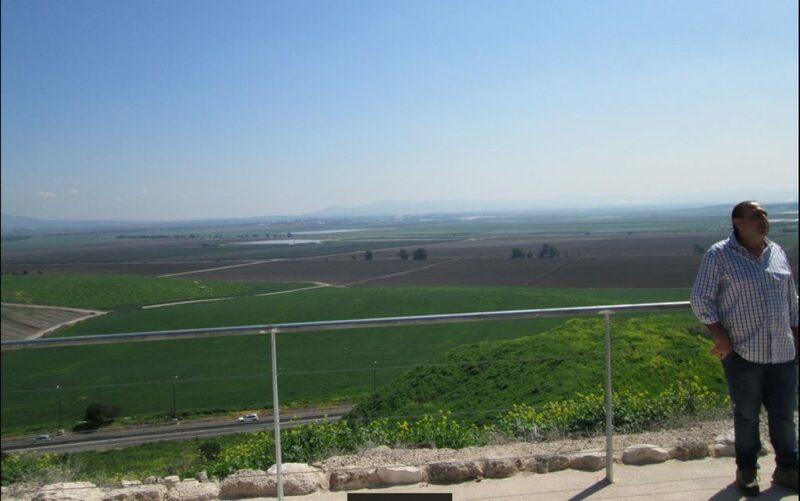 The Jezreel Valley takes its name from the ancient city of Jezreel. The word Jezreel comes from the Hebrew, and means “God sows” or “El sows”. The phrase “valley of Jezreel” was sometimes used to refer to the central part of the valley, around the city of Jezreel, while the southwestern portion was known as the “valley of Megiddo”, after the ancient city of Megiddo, which was located there. 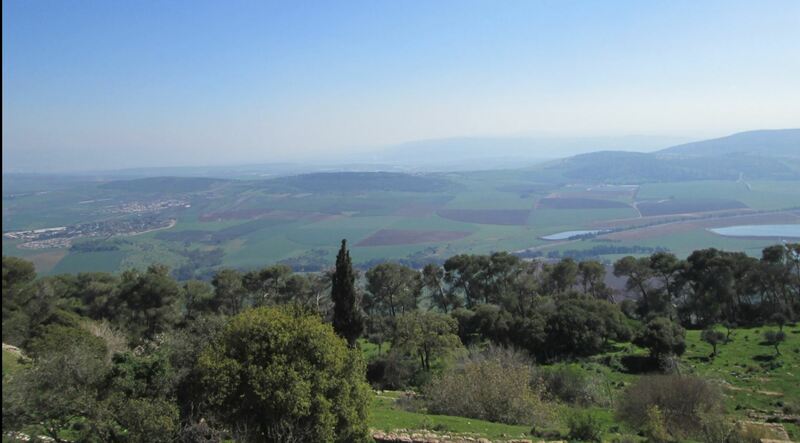 The area has been known as the Plain of Esdraelon (Esdraelon is the Koine Greek rendering of Jezreel).Armageddon is mentioned in the NT (Rv 16:16). Most Christians know the book of Revelation prophesies an end-times battle that will be fought at a place called Armageddon (Rv 16:16), and many know that Armageddon is, in fact, a corruption of the Greek, (Harmagedon) or “the hill of Megiddo.”The valley perhaps once acted as the channel by which the Dead Sea, located southeast of the valley, connected to the Mediterranean Sea. About two million years ago, as the land between the Mediterranean Sea and the Jordan Rift Valley rose, this connection was lost, and periodic floods from the Mediterranean Sea ceased. This resulted in the Dead Sea no longer having a connection to the ocean, and over time, due to greater evaporation than precipitation plus surface water inflow, it has become heavily saline. Continue to Haifa where you will ascend Mt. Carmel for a magnificent view of the sea and harbor. Haifa has been inhabited for the last 10,000 years. It is the home port for the Israeli Navy and the US 6th It is the world center for the Bahai monotheistic faith which started last century in Iran. 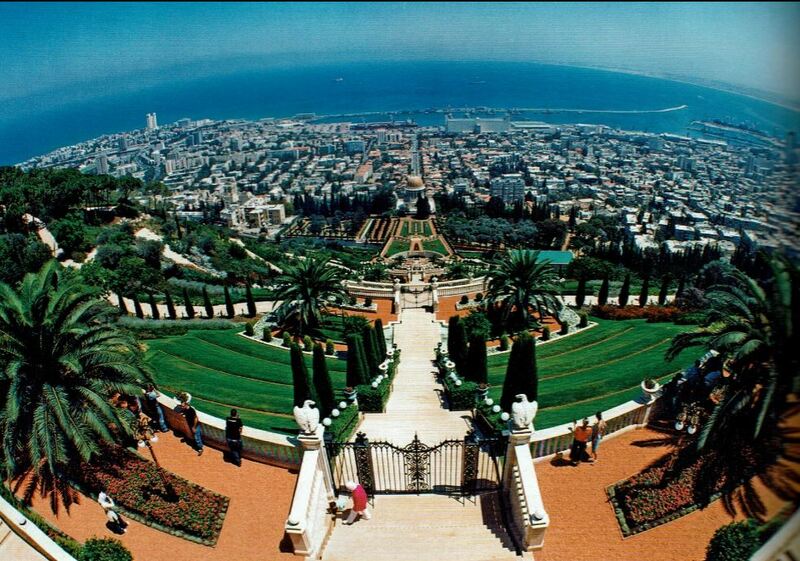 See the Carmelite Monastery and Elijah’s Cave as well as the Bahai Temple with the Persian Gardens. Proceed to Tiberias for the night. 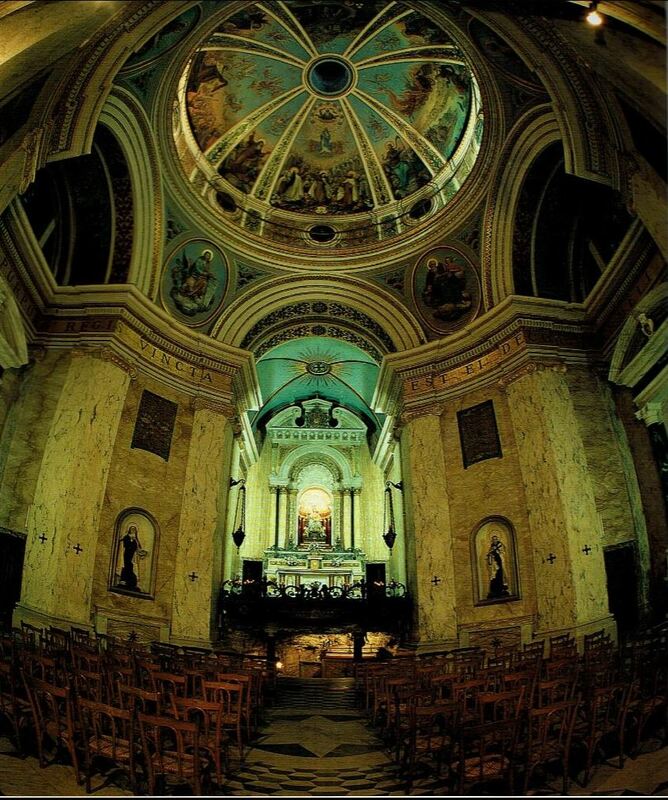 A Carmelite monastery was founded at the site shortly after the Order itself was created, and was dedicated to the Blessed Virgin Mary under the title of “Star of the Sea” (“stella maris” in Latin), a common medieval presentation of her. One of the oldest scapulars is associated with Mount Carmel and the Carmelites. According to Carmelite tradition, the Scapular of Our Lady of Mount Carmel was first given to Simon Stock, an English Carmelite, by the Blessed Virgin Mary. The Carmelites refer to her under the title “Our Lady of Mount Carmel” in honor of the legend, and celebrate 16 July as her feast day. The Order was founded at the site that it claimed had been the location of Elijah’s cave, 1,700 feet (520 m) above sea level at the northwestern end of the mountain range; this, perhaps not coincidentally, is also the highest natural point of the mountain range. Though there is no documentary evidence to support it, Carmelite tradition suggests that a community of Jewish hermits had lived at the site from the time of Elijah until the Carmelites were founded there; prefixed to the Carmelite Constitution of 1281 was the claim that from the time when Elijah and Elisha had dwelt devoutly on Mount Carmel, priests and prophets, Jewish and Christian, had lived “praiseworthy lives in holy penitence” adjacent to the site of the “fountain of Elisha” in an uninterrupted succession. Return to the Hotel, about 4:00 PM.